Yes you there, sitting behind your computer with your hands in your hair because you've just 'misplaced' your data and now it's all gone. Everything! Your documents, photo's, bookmarks, music, etc....your entire digital life that was on that little piece of hardware called a harddisk. First time? Second?! Third!!! It doesn't really matter, it's YOUR fault. Oh sure, the harddisk failed or something else did but still YOU should have made the necessary preparations for just such occurrence. When you drive in a car you buckle your seat belt right? Why? Cause you might need it or just for the hell of it? In life you sometimes need to prepare yourself for the inevitable. Computers aren't different. Hardware failure is common and when it happens to you, you need to be prepared. How do you prepare yourself in case hardware fails and your data goes down the drain? Well you back it up onto an external source, this way the data is safer. This external source can be lots of things, one that is quite commonly used nowadays for simple desktop computers is an external harddisk, this a cheap and easy solution. Another would be an offsite source, say a networked computer on a different location. This would be the more secure option of the two, say in case of lightning strike or some other disaster on one location which would not effect the other. But how do get the data to the source. Well you need a program that handles it for you. There are several backup programs, eg. 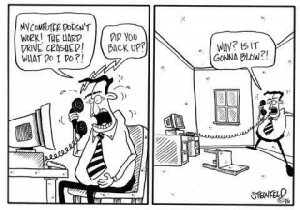 backup solutions. Some that handle backups to external harddisk, while others handle offsite backups. Although there are programs that can do both but I'm gonna keep it simple. A few backup solutions are listed below.